Last night, I posted a message on Facebook saying I would explain in detail how to get iTunes to work after applying the iTunes update released on 1/24/2014. To quickly get to your control panel on a Windows 7 or 8 Computer, open the Start Menu and click in the search box. Type in “Control Panel” to pull it up. Next, click Programs and Features. This will pull up the list of just about every program installed on your computer. Before you do anything further, make sure you do not have an Apple Device–iPad, iphone, iPod and do on–connected to your computer. I slightly edited the original text to clarify the Operating Systems this fix will work on as well as to point out the ordering after iTunes does not matter as long as ALL of the listed programs are ALL uninstalled. If you use Safari and/or iCloud DO NOT ininstall them even though they are both Apple Products. These two programs DO NOT share files with iTunes like the four listed with iTiunes above do. After you uninstall all five programs, reboot your machine, download iTunes and re-install it using Run as Administator. That’s it you’re done. Your Library should not be effected as your library is automatically stored in separate areas from the program files. Even so, it’s a good idea to back up your library on an External Hard Drive or iCloud if you have a big libarary. You will need to reinstall your Apple Devices to the affected computers. This is why I said to unlug your devices before you start the process. All you should need to do to reinstall the driver(s) for your device(s) is plug it in after you’ve installed iTunes. Windows will do the rest. That’s basically it. I hope this proves helpful! Four years later, Port-au-Prince looks just as it did the day a 7.0 Earthquake rocked country, its capital the epicenter. Even four years later there is no official death toll though according to multiple sources it’s at least 100,000, most in and around Port-Au-Prince. Let me put that in perspective: At the time of the earthquake, Haiti’s population was 4 million. It’s believed there are 8 millon Haitian nationals living around the world. Not a single one of that 8 million did not know someone who died in the Earthquake. It was the first time since another catastrophic natural disaster–Huricane Katrina–that I followed the news so closely in the days and weeks following the earthquake. One thing that jumped out at me was the call for relief aid not from Haiti but from the international community. And boy did it come pouring in. Never before and never again has hundreds of billions of dollars–I’m not exaggerating–been raised in relief aid. That’s nothing short of miraculous. Unfortunately, one can only imagine the great good all the money and resources amassed could have done. For a nation that even before the Earthquake has 95% of its population living below the poverty line, it it also has the most corrupt in the Western Hemisphere. Know the billions in relief aid I just mentioned? It’s sitting in a warehouse in Haiti collecting dust and has been since it started pouring in. Haiti’s beginning is one to be admired: It became the first African Republic in thew Western Hemisphere when it gained its independence from France in 1848. In the 178 years since then daily life in Haiti is not what one would come to expect compared to its neighbors. As a friend at a school I worked at often told me, being poor in the U.S. is nothing compared to being poor in Haiti. In the U.S. you can get government assistance. In Haiti you pray a relief organization comes to your neighborhood before you die of hunger. Some children eat mud pies just to stop the pangs of hunger. Why, oh why would a government that clearly lacks the resources and the will to feed its own people deny said people the aid the world readily sends to them? As much as people like to knock Sudan, Somalia, Yemen and North Korea they welcome outside aid. The obvious fact the Haitian government doesn’t care about their own people aside, it’s common knowledge that they seize all aid supplies brought in as “contraband” and turn around and sell it on the black market. There have been coups and coup attempts over the years but it’s just been one corrupt government replaced with another. Former president Jean-Bertrand Aristide–the last democratically elected president of Haiti–was ousted in a coup during the 1990s and fled to Kenya, taking the hundreds of millions he stole from the country with him. Will things ever improve in Haiti? Only if someone who actually cares comes to power. Considering the people of Haiti has been relying on outside aid just to scrape by for the last 40 years, one might wonder why a developed nation like the United States isn’t doing more than it has to help the country. The US Military took over Haiti’s only international airport in Port-au-Prince in the days following the earthquake to help coordinate relief efforts but that privilege was quicky revoked after the Haitian government realized they were deliberately being left out of the planning and logistics of the relief efforts. This was quckly followed by reinstating an import tax on aid supplies being brought in that was intially waived. Yes, I’m serious: It is on the books in Haiti that the country of origin is to be billed for the AID they willingly give to help the people of Haiti. Said aid is then seized upon arrival and put in a warehouse, never making it to the people who need it. To those from Haiti who may be reading this I’m not trying to knock your homeland. The Haitian government’s the problem, not the people. The problem is the country has yet to have a government worthy of its people. Perhaps unsurprisingly to critics of the unsanctioned trip to North Korea, Dennis Rodman issued a written apology to the family of Kenneth Bae for his comments during the now damning interview he did on CNN last week. The apology had to happen since the media deliberately misonstrued his words to make it look like he said he doesn’t give a damn about the fact Mr. Bae is being held prisoner by the North Korean government. As for why he said what he said, Rodman said it was from stress (understandable) and that he was drunk when he did the interview. 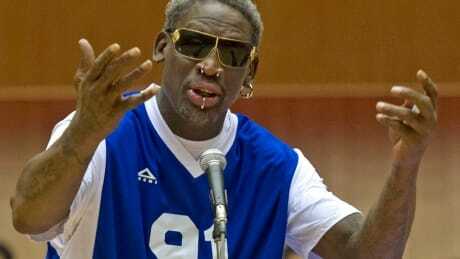 As for the trip itself, former NBA star and humanitarian Charles Smith, who joined Rodman along with 5 other players defended the trip during the interview. It wasn’t until after they played against the North Korean national team that he and the other players realized they were being used for propeganda by the North Korean government. The vets lost the game but when you consider it hasn’t been that long since most of them played in the NBA (it’s been almost 19 years for Rodman) it quickly became clear the game was fixed to ensure they would lose. They parted ways with Rodman upon landing in Beijing where they presumably took a connecting flight back to the U.S. Unlike most folks who take the rhetoric CNN, MSNBC and Fox News spews daily at face value, I’ve learned to look at stories like this using a far less pre-biased lens. The other article I wrote last week is one such example. Unlike most who refused to give Dennis Rodman the benefit of the doubt, I waited until all the facts were revealed before commenting on the trip and its intent. For starters, what Rodman intended and what ended up happening were two different things. As everyone knows he is a personal friend of Kim Jong Un. This is a clearly established fact. As Kareem Abdul-Jabbar said in an interview on CNN (Speaking of which, I noticed he was being very careful with how he said what he said) yesterday, if you’re going to go to North Korea you need to have a clearly defined objective going in. Judging from the interviews with the players who went to the most secretive country on the planet when they landed in Beijing, it ended up being nothing more than a dog and pony show. As possibly the only American who can openly say they are a close friend of The Supreme Leader of North Korea, his value to the rest of the west should not be overlooked just because he’s not a politician or a diplomat. I would not be opposed to him making return trips to North Korea either. I think it’s becoming more and more apparent there is a growing curiousity of the outside world by North Koreans. When Rodman said the door will one day open it was obvious he was being sincere. I also said in my previous blog the U.S. is in open talks with Iran. If the U.S. can open communications with Iran for the first time in over 35 years, why not North Korea? The question deserves serious consideration. With a diplomat like John Kerry, anything’s possible. The “rant and tirade” CNN called it? He was understandably furious. Yes, his genuine friendship with Kim Jong Un is mutual. Yes, he knows about Mr. Bae’s situation. Yes, he knows very cleary about what’s going on in North Korea. If you look carefully at the video footage of Rodman in Pyongyang you will notice something you don’t see when reporters visit North Korea: No government minders are trailing him. CNN Journalist Wolf Blitzer was pretty adamant about government minders following outsiders from the West everywhere. OK, look: Try to look at this from Rodman’s perspective. Like he said when the reporter in America who was interviewing him tried to bait him into talking politics, he and the players with him are IN North Korea right now. He’s not stupid. The players with him aren’t stupid. They’re not going to say ANYTHING that might jeopardize their safety or their freedom to leave the country. What the reporter who did the interview tried to do–and Rodman drove the point home very clearly–was bait him into a subject that could put them in danger. Remember: Both the U.S. Justice Department and the NBA have denounced the players who’ve chosen to participate in this cultural exchange, which doubles as a birthday present for Kim Jong Un. What the West keeps ignoring is if this cultural exchange is a success, it will lead to other things. It’s obvious Kim and Dennis can directly speak to each other without a translator so…yeah. It’s also seems North Korea isn’t opposed to the idea of opening relations with “the enemy”. Otherwise why invite Rodman back into the country? All these North Korean refugees jumping down Rodman’s throat on Facebook KNOW he is in an influential position. If he speaks to The Supreme Leader, he will be heard. Going back to Rodman’s thoughts on Mr. Bae’s situation, he said something interesting before he stopped himself in that interview this morning: “You don’t know what happened.” It’s not what he said but the way he said it that I found most telling. Watch the interview again. Notice the increased emotion when he says that sentence. I think Dennis Rodman does know why Mr. Bae is still being held by North Korea. For reasons we don’t know or understand he’s not going to talk about the why. There’s also the fact we know Mr. Bae is still alive and is in a hospital in Pyongyang. If they wanted him dead he would’ve been killed already but he’s being taken care of. He is in a hospital room, not a jail cell. 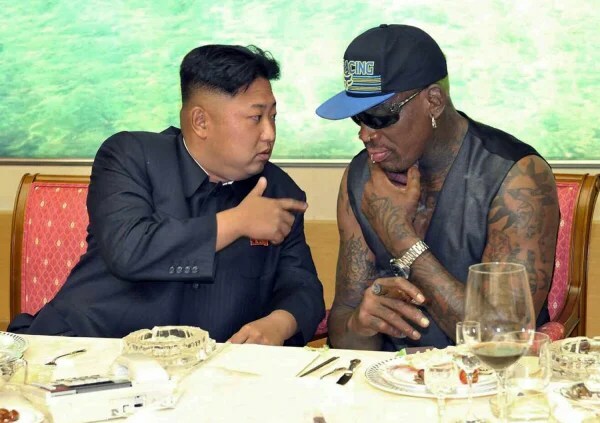 I believe Dennis Rodman will one day be vindicated as a diplomat in the eyes of the west. As I said on Facebook earlier tonight this game could lead to other things down the road.